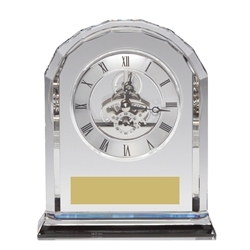 This clock is made of optical crystal and comes packaged in a velvet lined presentation box. It's a perfect option for a corporate award or gift. Clock measures 6.75" tall by 5" wide, with a 1" depth. We add your free text on a gold metal plate attached underneath the clock face.